Gomphotherium is a stem taxon of Elephantida that was widespread in Africa, Eurasia, and North America during the Miocene. However, the evolution of this genus is greatly debated because of morphological variation among the species of Gomphotherium. In the present work, we describe a cranium and accompanying material of Gomphotherium from the late middle Miocene Hujialiang Formation of Linxia Basin, China. The new material shows dental similarities to G. subtapiroideum from the middle Miocene of Europe; however, it displays some cranial, mandibular, and dental feature combinations that are distinct from the known species of Gomphotherium. 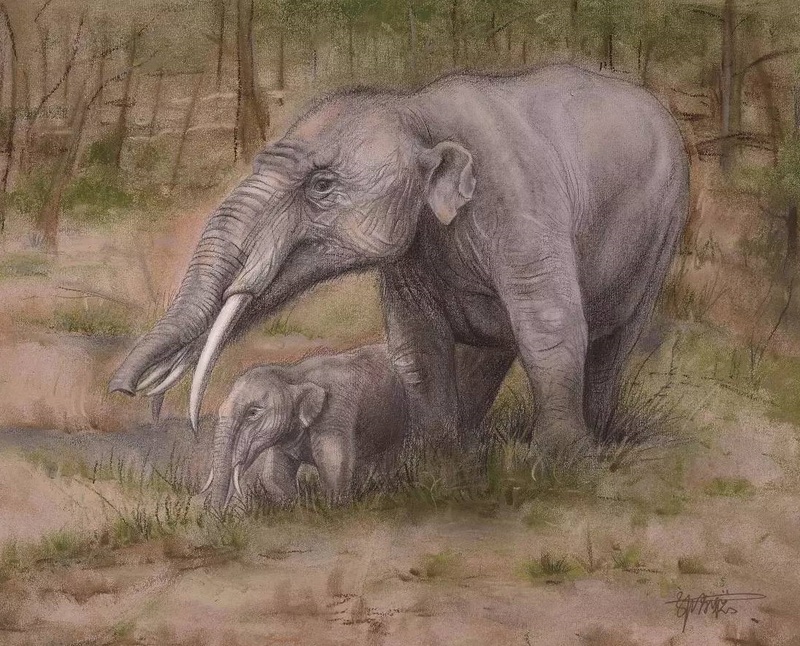 Therefore, a new species, Gomphotherium tassyi, is established. We further study the phylogeny of Gomphotherium by cladistic analysis and recognize four groups. The most basal ‘G. annectens group’ is a paraphyletic group that includes G. annectens, G. cooperi, G. sylvaticum, and G. hannibali. The African taxa, G. libycum and G. pygmaeus, constitute a monophyletic group that has not been named. The ‘G. angustidens group’ is a monophyletic group that includes G. inopinatum, G. mongoliense, G. connexum, and G. angustidens. 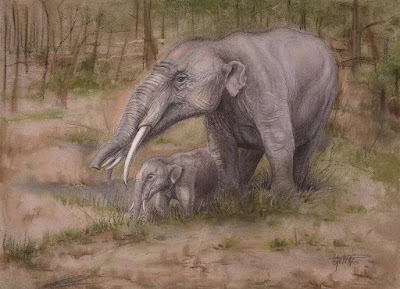 In addition, the ‘derived Gomphotherium group,’ which includes G. subtapiroideum, G. tassyi, G. wimani, G. browni, G. productum, and G. steinheimense, was widely distributed in Eurasia and North America during the middle and late Miocene. We describe a new species of Cornufer, subgenus Batrachylodes, from high-elevation forests of New Britain Island in the Bismarck Archipelago of Eastern Melanesia. The new species, Cornufer exedrus sp. 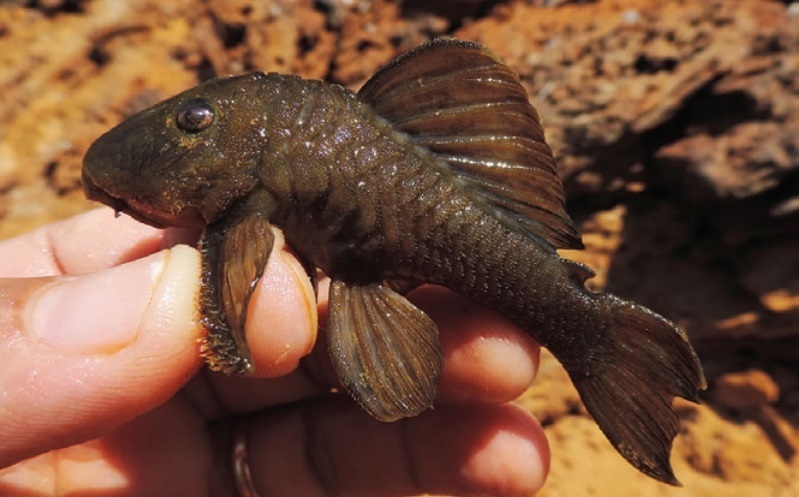 nov., is a biogeographically disjunct member of the Batrachylodes clade, representing the first record of the subgenus from outside of the Solomon Archipelago. The new species is a small terrestrial form from dense, closed-canopy forests above 1500 meters elevation in the Nakanai Mountains of eastern New Britain. It differs from its closest relatives, the other members of the subgenus Batrachylodes, on the basis of its minute body size, degree of digital disc expansion, reduced subdigital tuberculation, color pattern, and other traits related to its small size. We also provide a description of the new species’ simple advertisement call. 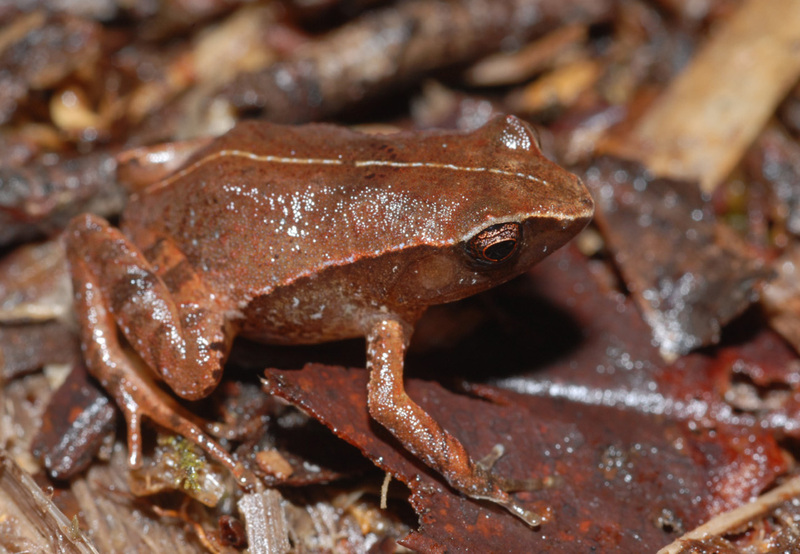 The diversity of ceratobatrachid frogs of the Bismarck Archipelago is most likely still underestimated despite several recent surveys. 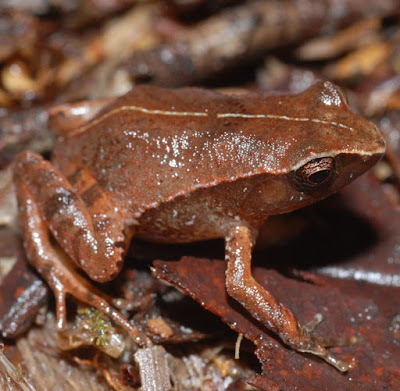 Our understanding of evolutionary trends and species boundaries in the subgenus Batrachylodes currently is hampered by lack of genetic samples and call recordings corresponding to voucher specimens of the endemic species of Bougainville Island. in Battiston, Correas, Lombardo, Mouna, Payne & Schütte, 2018. Species in the genus Ameles Burmeister and Pseudoyersinia Kirby (Amelini) are traditionally defined as small-sized, ground-dwelling mantids whose males are distinct for being, respectively, macropterous and brachypterous. However, comparative morphological studies across Amelini confirmed the existence of short-winged males in Ameles, suggesting that this traditional diagnostic concept does not apply to all species. Our analyses of several species from West Mediterranean localities (Canary Islands, Spain, Italy, and Morocco) resulted in the relocation of Pseudoyersinia andreae Galvagni, 1976 to Ameles as Ameles andreae (Galvagni, 1976) (n. comb.) with Ameles insularis Agabiti, Ippolito & Lombardo, 2010 as its new synonym (n. syn. 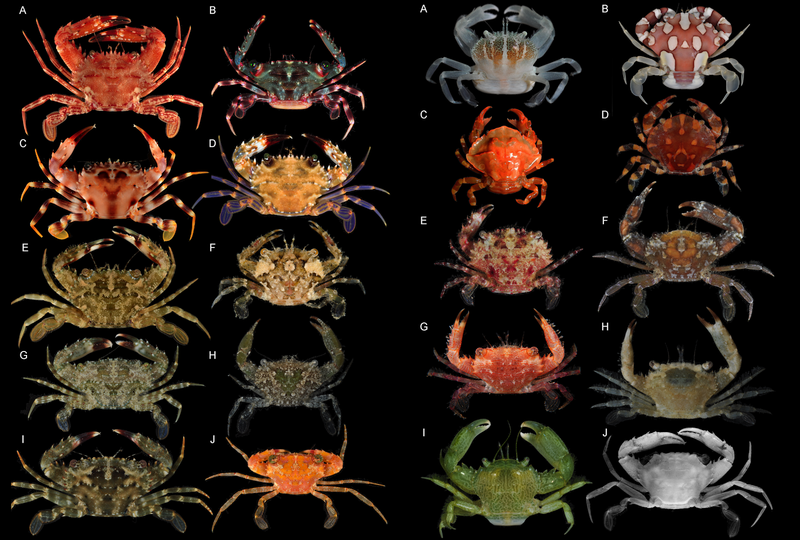 ), the clarification of the taxonomic identity of A. gracilis (Brullé, 1838) and A. maroccana Uvarov, 1931, including diagnoses of their males, and the description of Ameles spallanzania obscura (n. ssp.) (from Spain). We also take the opportunity to describe Pseudoyersinia maroccana (n. sp.) 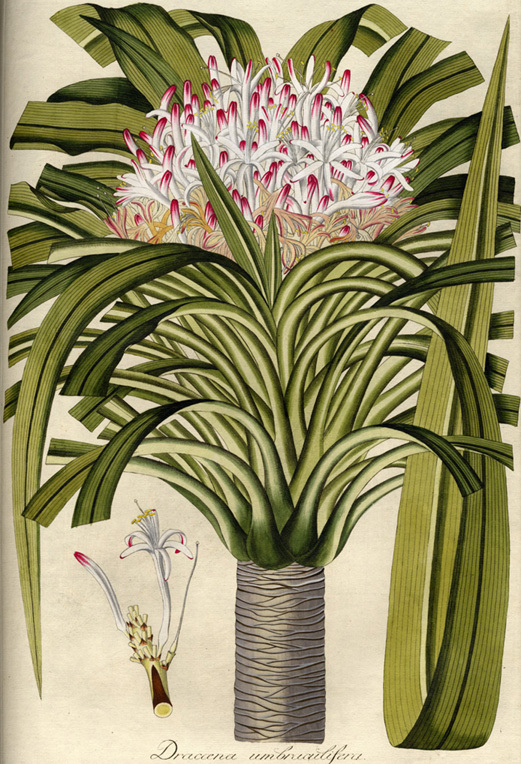 (from Morocco) based on museum specimens separating it from Ameles maroccana Uvarov, 1931. We also found that wing length is positively correlated to ocelli size. 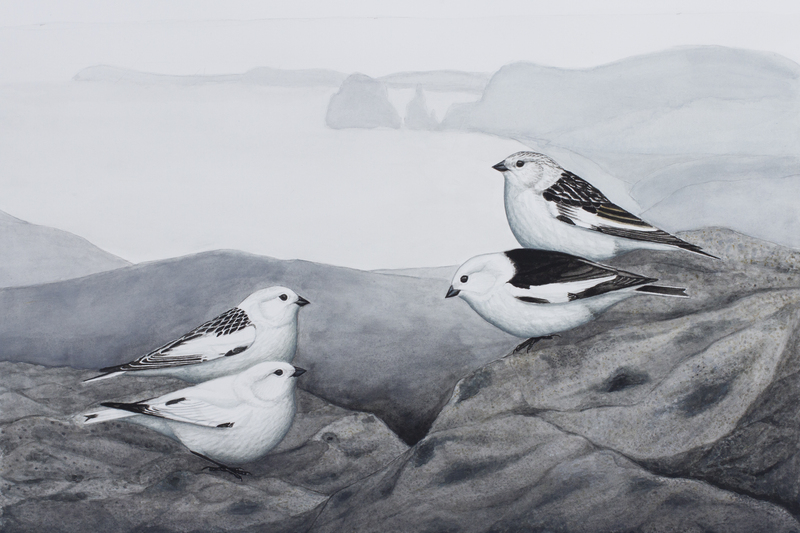 We discuss this trend from an ecological, evolutionary, and biogeographic perspectives to both facilitate species circumscription and justify the taxonomic modifications herein introduced. • A molecular systematic study was conducted for the wide-ranging Trachylepis varia complex. • Phylogenetic analyses support the existence of at least eight species within the Trachylepis varia complex. 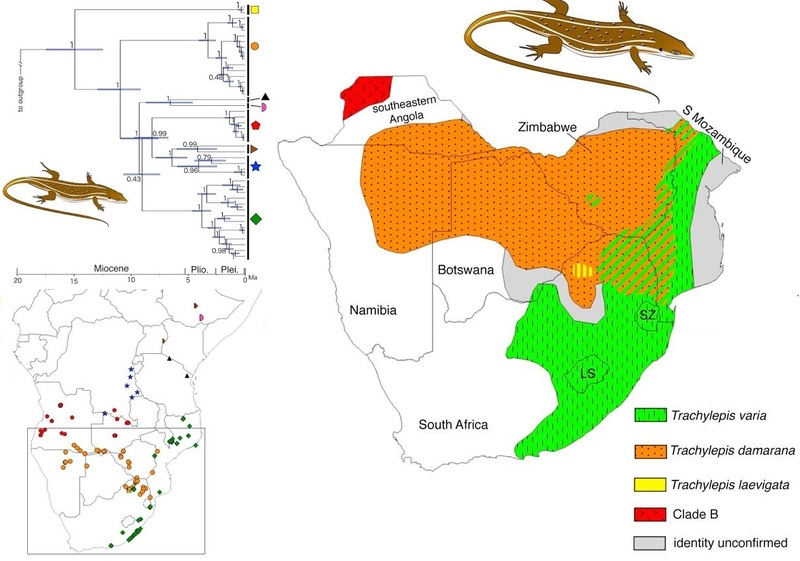 • The Southern African members of the Trachylepis varia complex are phenotypically distinct. 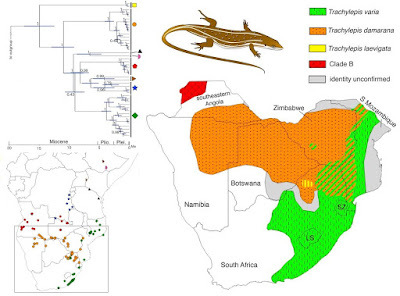 • We update the taxonomy for the southern Africa members of the Trachylepis varia complex. • Diversification within the Trachylepis varia complex began during the mid to late Miocene or early Pliocene. A systematic study of the Trachylepis varia complex was conducted using mitochondrial and nuclear DNA markers for individuals sampled across the species range. 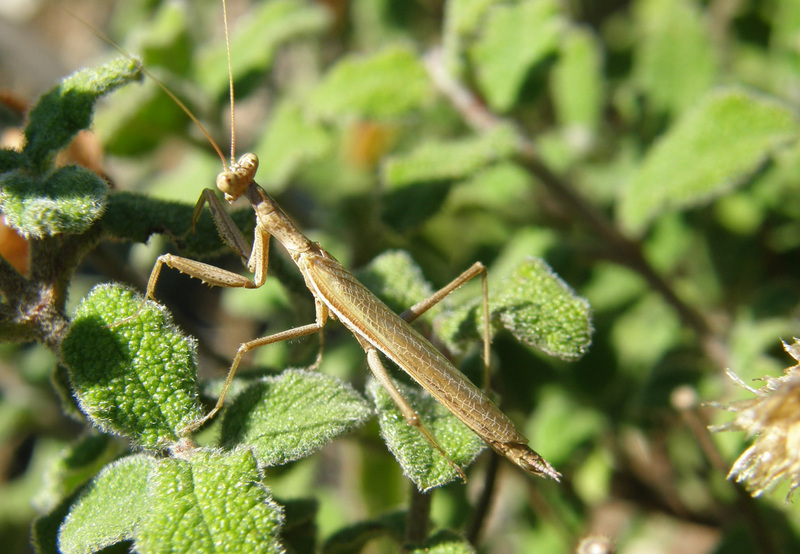 The taxonomic history of T. varia has been complicated and its broad geographic distribution and considerable phenotypic variation has made taxonomic revision difficult, leading earlier taxonomists to suggest that T. varia is a species complex. We used maximum likelihood and Bayesian inference to estimate gene trees and a multilocus time-tree, respectively, and we used these trees to identify the major clades (putative species) within T. varia. 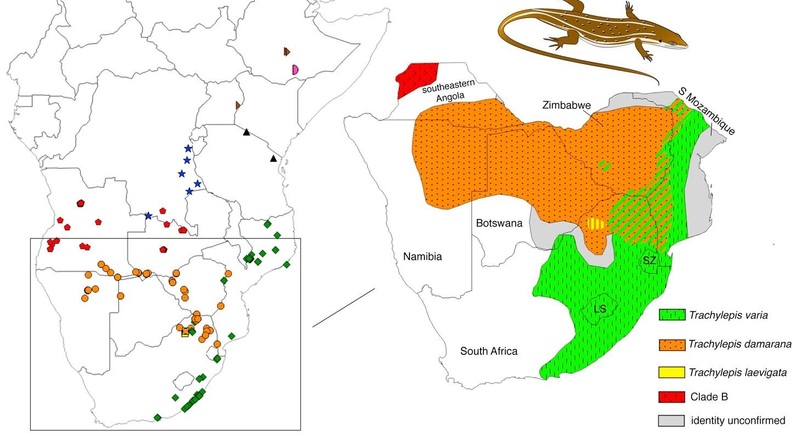 Additionally, we used morphological and color pattern data to distinguish and revise the taxonomy of the southern African clades. The major clades recovered in the multilocus time-tree were recovered in each of gene trees, although the relationships among these major clades differed across gene trees. Genetic data support the existence of at least eight species within the T. varia complex, each of which originated during the mid to late Miocene or early Pliocene. We focus our systematic discussion on the southern African members of the T. varia complex, revive Trachylepis damarana (Peters, 1870) and T. laevigata (Peters, 1869), and designate lectotypes for T. damarana and T. varia. Trachylepis damarana from Haenertsberg, Limpopo Province, South Africa. We find strong evidence that Trachylepis varia, T. damarana, and T. laevigata are distinct species that occur in southern Africa and that five additional, species-level clades occur north of the Zambezi and Kunene rivers, although future studies are needed to determine whether Trachylepis nyikae and Trachylepis isellii should also be recognized. 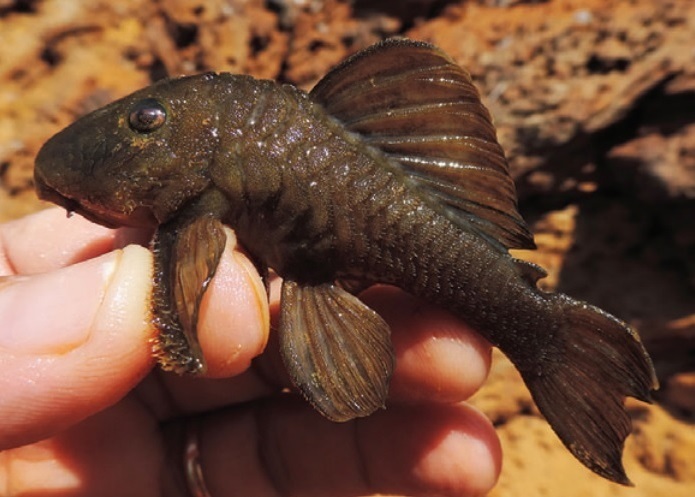 The allopatric distribution and morphological distinctiveness of T. isellii (Largen and Spawls, 2010) suggests that this species is probably valid and the presence of multiple endemic species on the Nyika Plateau (Poynton, 1997; Burrows and Willis, 2005) suggests that T. nyikae may also be a valid species. 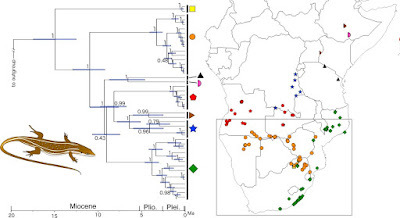 Additionally, little is known about the distribution or natural history of the undescribed species sampled in Ethiopia, Democratic Republic of the Congo, or Tanzania. Lastly, next generation DNA sequencing may be useful in resolving deeper phylogenetic relationships within the T. varia complex and for distinguishing historical gene flow from incomplete lineage sorting. 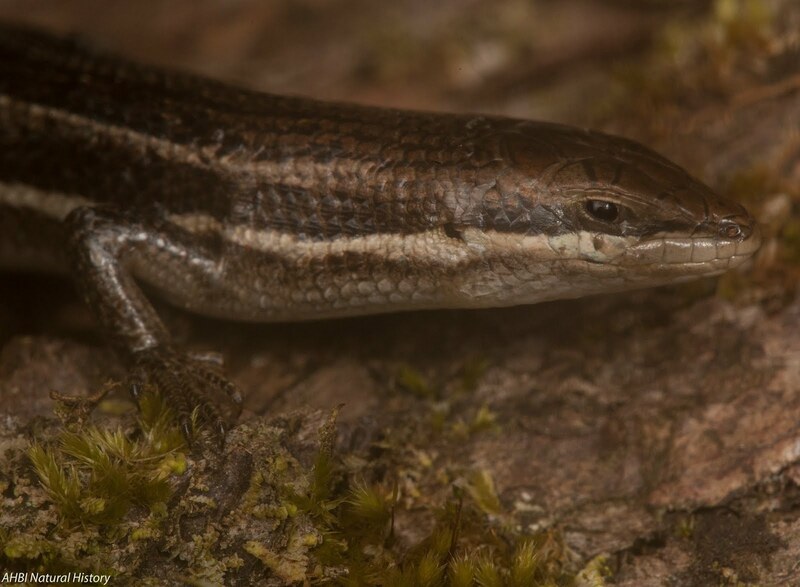 This study is the first to use genetic data to address species diversity, phylogenetic history, and taxonomic issues for the T. varia complex and is an example of how both genetic and phenotypic data can be used to resolve taxonomic problems and to estimate species ranges. 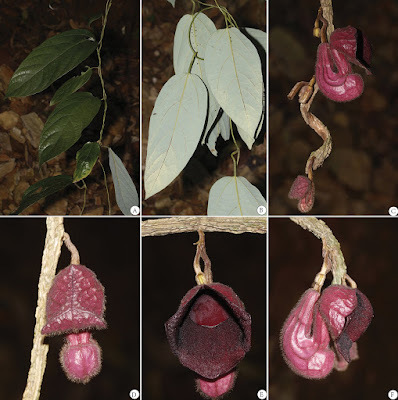 Aristolochia sinoburmanica Y.H.Tan & B.Yang, a new species of Aristolochiaceae from Putao, Kachin State, Myanmar, is described and illustrated. According to morphology (strongly curved perianth, 3-lobed limb, as well as 3-lobed gynostemium, anthers 6, adnate in 3 pairs to the base of gynostemium, opposite to the lobes), the species belongs to Aristolochia subgenus Siphisia. It is morphologically similar to A. faviogonzalezii, A. hainanensis, A. tonkinensis, A. saccata and A. xuanlienensis. The major differences between them are outlined and discussed. 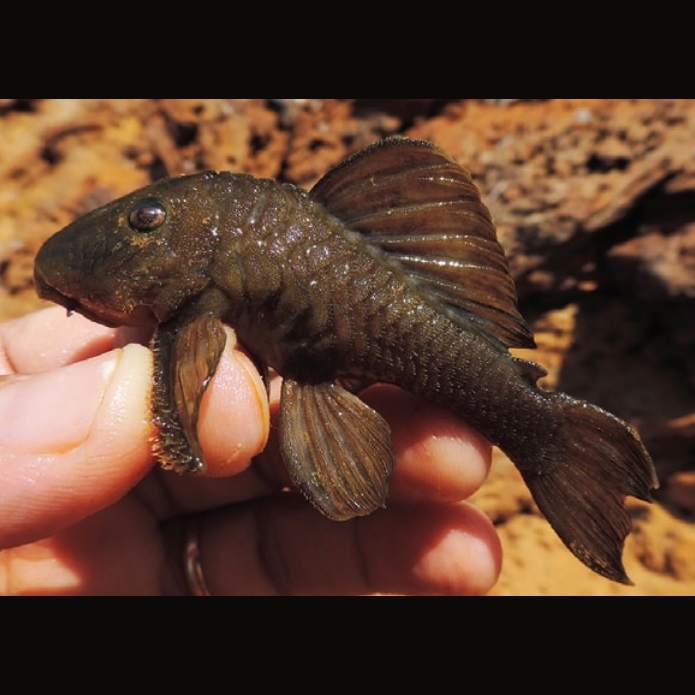 A detailed description, along with line drawings, photographs, habitat, distribution and conservation status, as well as a comparison to morphologically similar species, are also provided. Figure 2. Aristolochia sinoburmanica Y.H.Tan & B.Yang, sp. nov.
A young branch and adaxial leaf B young branch and abaxial leaf C cymes on old woody stems D front view of preanthesis flower E front view of open flower F lateral view of open flower G lateral view of young flower H longitudinal section of flower I gynostemium, ovary and pedicel. (Photographed by Y. H. Tan, H. B. Ding & B. Yang). Aristolochia sinoburmanica Y.H.Tan & B.Yang, sp. nov. Diagnosis: Aristolochia sinoburmanica is morphologically similar to A. hainanensis Merrill, A. saccata Wallich, A. xuanlienensis (Huong et al. 2014), A. faviogonzalezii T. V. Do, S. Wanke & C. Neinhuis and A. tonkinensis T.V. Do & S. Wanke from Vietnam (Do et al. 2015a), but is distinguishable from these species by the following diagnostic characters: leaf blade ovate or ovate-lanceolate to narrowly ovate, subcoriaceous, base rounded to slightly cordate; cyme solitary on old woody stems and young branches, each cyme with 1–2 flowers; perianth claret (deep purple red), outside densely brown hirsute with parallel dark purple veins, 6.5–7.5 cm high; tube horseshoe-shaped, 8.3–8.5 cm, uniformly claret (deep purple red), with visible dark purple veins, limb trumpet-shaped, 4.2–4.8 cm high, 4–4.4 cm wide, 3-lobed, lobes subequal; throat deep purple red, glabrous. Etymology: The species epithet refers to the type locality in Myanmar and adjacent regions of China. It also shows that the two countries are friendly neighbours, their friendship being retained over a long period and also expresses our appreciation for the whole-hearted cooperation amongst members of the China-Myanmar joint expedition. Distribution and habitat: Aristolochia sinoburmanica is hitherto known from the type locality of Putao, Kachin state in north Myanmar and adjacent regions of Gongshan County, northwest Yunnan, southwest China, where, according to one sheet of the specimen deposited in KUN, it is a perennial liana which grows under the montane broadleaf forests, at an elevation of ca. 900–1400 m.
Discussion: Aristolochia sinoburmanica is morphologically similar to A. faviogonzalezii, A. hainanensis, A. tonkinensis, A. saccata and A. xuanlienensis. However, the new species differs from the aforementioned species in several important vegetative and reproductive characters (summarised in Table 1). A. sinoburmanica, with a horseshoe-shaped perianth of 3 lobes which are valvate in preanthesis, annulated perianth throat and gynostemium with trilobed stigma on top, each lobe consisting of one pair of stamens, belongs to the Aristolochia subgenus Siphisia (Wanke et al. 2006, Do et al. 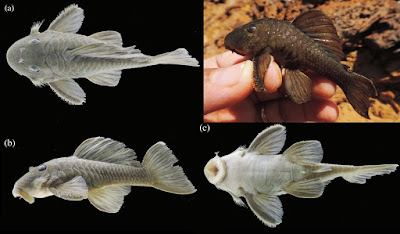 2015a).This new discovery, along with several new species recently described from Vietnam (Huong et al. 2014, Do et al. 2014, 2015a, 2015b), Guangxi and Hainan Island, China (Xu et al. 2011, Huang et al. 2013, Wu et al. 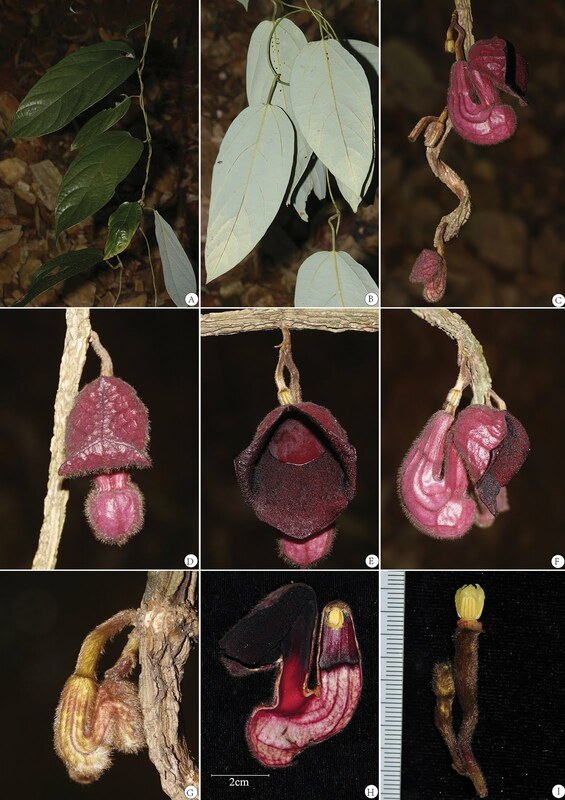 2013) and Peninsular Malaysia (Yao 2012), provide evidence that the genus Aristolochia and, in particular, Aristolochia subgenus Siphisia is very diverse in South-East Asia. 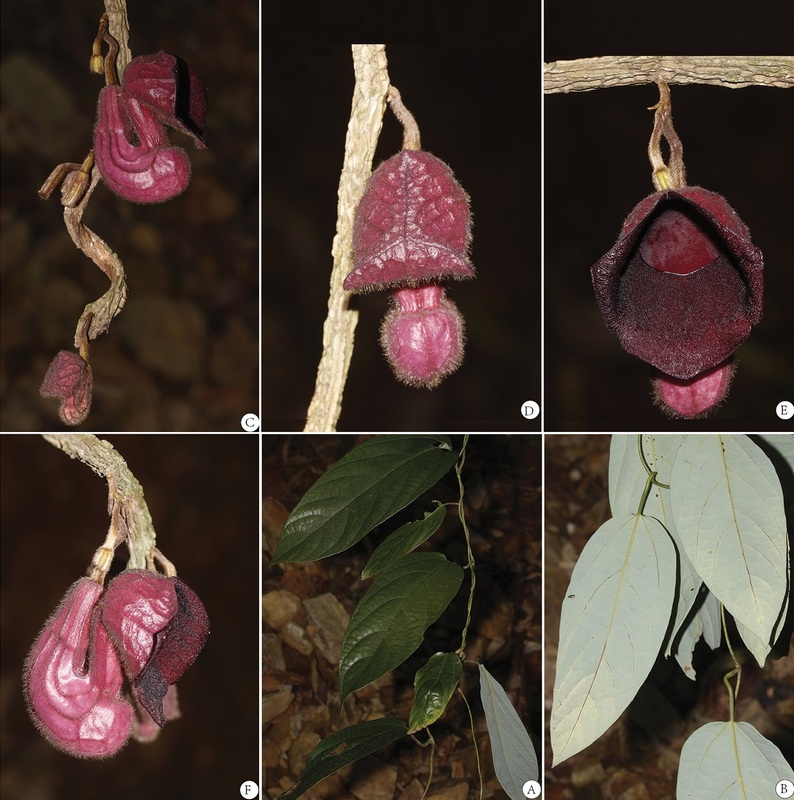 Currently there are only 12 Aristolochia species recorded in Myanmar (Kress et al. 2003), indicating that the species diversity of Aristolochia in Myanmar is still open to discovery. It is predicted that more new species will be discovered when more field investigations are conducted in this region. in Edwards, Bassüner, Birkinshaw, et al. 2018. Extinction is the complete loss of a species, but the accuracy of that status depends on the overall information about the species. 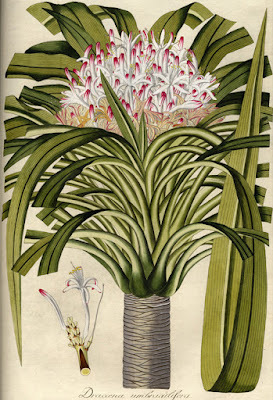 Dracaena umbraculifera was described in 1797 from a cultivated plant attributed to Mauritius, but repeated surveys failed to relocate it and it was categorized as Extinct on the IUCN Red List. However, several individuals labelled as D. umbraculifera grow in botanical gardens, suggesting that the species’ IUCN status may be inaccurate. The goal of this study was to understand (1) where D. umbraculifera originated, (2) which species are its close relatives, (3) whether it is extinct, and (4) the identity of the botanical garden accessions and whether they have conservation value. 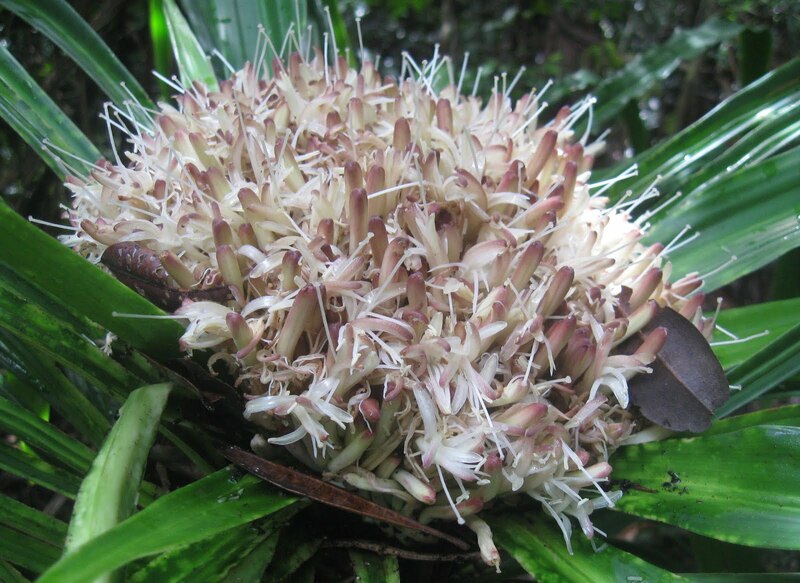 We sequenced a cpDNA region of Dracaena from Mauritius, botanical garden accessions labelled as D. umbraculifera, and individuals confirmed to be D. umbraculifera based on morphology, one of which is a living plant in a private garden. 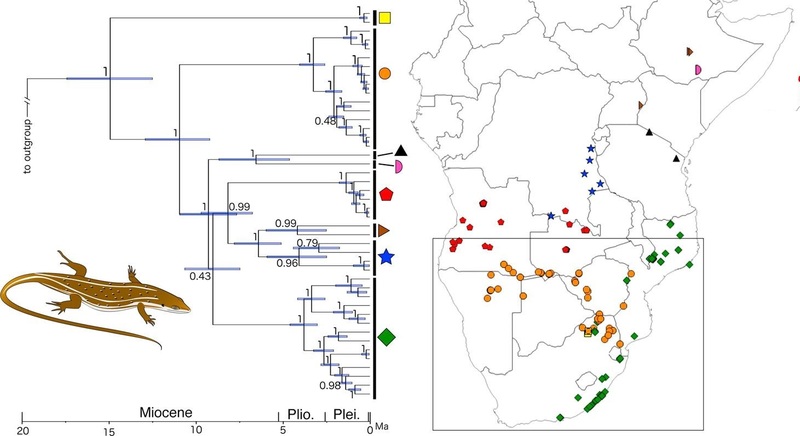 We included GenBank accessions of Dracaena from Madagascar and other locations and reconstructed the phylogeny using Bayesian and parsimony approaches. Phylogenies indicated that D. umbraculifera is more closely related to Dracaena reflexa from Madagascar than to Mauritian Dracaena. 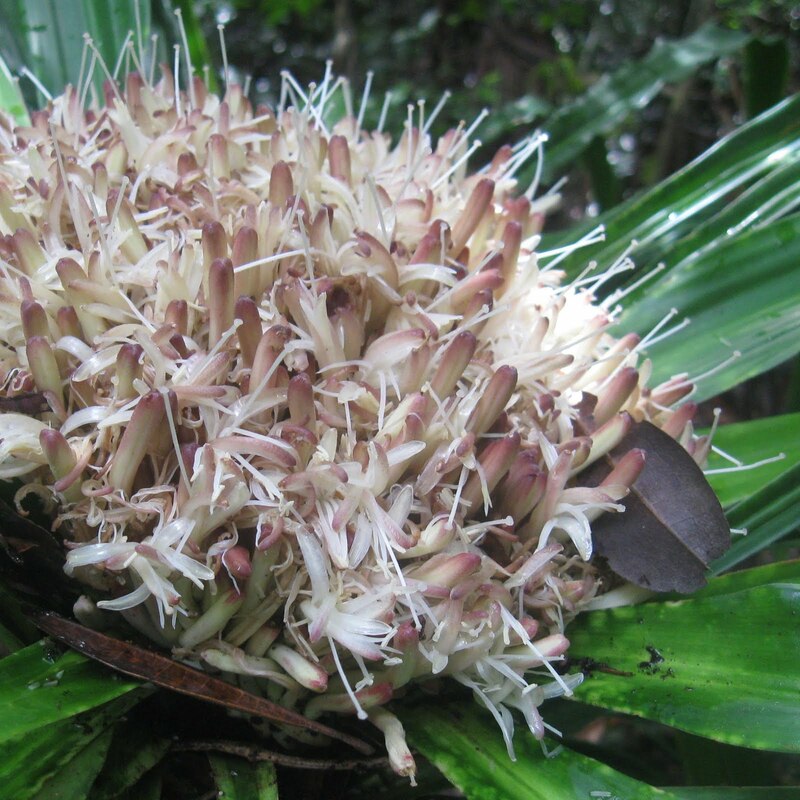 As anecdotal information indicated that the living D. umbraculifera originated from Madagascar, we conducted field expeditions there and located five wild populations; the species’ IUCN status should therefore be Critically Endangered because < 50 wild individuals remain. Although the identity of many botanical garden samples remains unresolved, this study highlights the importance of living collections for facilitating new discoveries and the importance of documenting and conserving the flora of Madagascar. 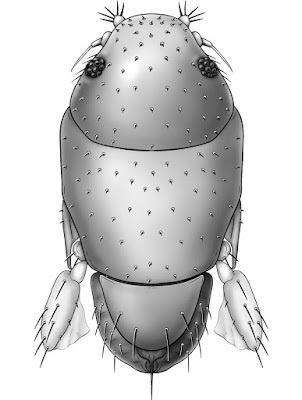 The genus Adelogorgia is distinguished from other holaxonians in having conspicuously ornamented double-disc sclerites and leaf clubs in the coenenchyme, and non-mineralised axis cores. The two eastern Pacific species currently recognised as Adelogorgia are diagnosed and illustrated. 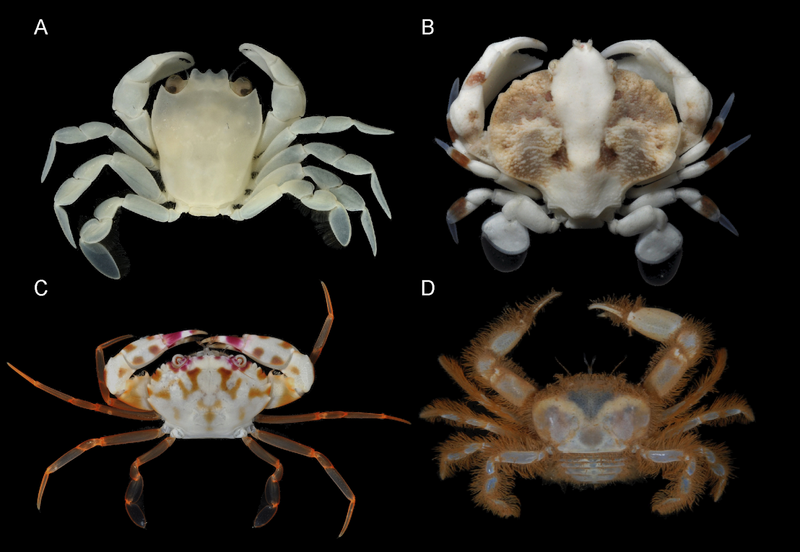 Three new species for the genus are described from new localities and depth ranges. Analysis of external and internal characters, especially sclerite colours and sizes, and colony colour, shape and branching, allows separating the species. An identification key to the five species is provided, as well as a character table for comparisons. This study was based on newly collected specimens from 50 to 200 m deep, and re-examination of all historical material. We conclude that the genus comprises five valid species with a wider distribution than previously reported. This research is a contribution to the octocoral systematics and biodiversity from mesophotic and deep waters. Adelogorgia Bayer, 1958: 46; Bayer 1978: 1026–1027; Harden 1979: 137. Type species. Adelogorgia phyllosclera Bayer, 1958 by original designation Type locality. La Jolla, California. Diagnosis (modified from Bayer, 1958; 1978). Colonies bushy, fan-shaped or sparsely branched. Branching lateral, irregular, or dichotomous; with moderately thick coenenchyme; polyps fully retractile, communicating directly with the longitudinal canal system (gastrodermal canals, solenia); anthocodia with eight subtentacular points consisting of spinous rods, not forming a distinct collaret. Polyp mounds prominent, slightly raised or flat, without specific types of sclerites, but leaf clubs concentrated around polyp apertures. Outer coenenchyme with conspicuous double discs with expansions on one side having various degrees of ornamentation; tuberculate spindles and leaf clubs. Axial sheath containing less developed spindles, radiates and capstans. Axis with wide cross-chambered central core. Loculi between lamellae and central core without mineralised filaments. Colony colours white, lemon-yellow, pink, orange and various hues of red. Sclerites of the same colours and colourless. Distribution. The species has been reported from La Jolla, California, USA; Galápagos Islands, Ecuador (Bayer 1958, 1978); Baja California, Mexico (Harden 1979); and recently found along Pacific coast of Costa Rica and off Pacific coast of Panamá. Reported from 30 to 300 m deep (Cairns et al. 2002). (A) colony; (B) detail of the branches; (C) sclerites. Habitat and Distribution. The species has been collected by bottom trawls from sandy or muddy-sand substrata. It was also obtained from fishing lines and nets from rocky shoals, where the colonies were ripped as bycatch or were entangled in the lines from 40 to 60 m deep. Adelogorgia osculabunda was commonly collected together with Leptogorgia regis Hickson, 1928, Muricea fruticosa Verrill, 1868, Muricea subtilis Breedy and Guzman, 2016 and two Psammogorgia species. The species was found at various localities in Costa Rica, from: off Salinas Bay and Santa Elena Bay to Cape Santa Elena, Guanacaste (northern Pacific); and Punta Mala, Puntarenas (central Pacific) that suggests a wide distribution of the species along the Pacific. In Panamá, Pearl Islands, the colonies were obtained by dredging at 80 m deep, which presently represents the deepest record. Etymology. Named osculabunda, Latin adjective derived from osculum: little mouth, kiss. In Latin context, osculabunda is the one that covers with kisses, in allusion to the red prominent polyp-mounds that cover the branches. Remarks. This species is similar to A. hannibalis in the prominent polyp-mounds showing a little darker orange contrasting with the colony colour, but is not as evident as in A. osculabunda. Thinner colonies of A. osculabunda look similar to A. hannibalis, but in A. osculabunda, the polyp-mounds are closer and stiffer than in A. hannibalis. Additionally, sclerite analysis shows clear differences between the two species. Habitat and Distribution. The species was found on the Hannibal Bank, a coastal guyot-type seamount that rises from approximately 500 m to 45 m, located 50 km from the mainland (Cunningham et al. 2013). The seamount is relatively protected as part of the Coiba National Park and World Heritage. The species was found on rocky substrate with strong currents. It is only known from the type locality, Hannibal Bank, from 180 to 200 m deep. Etymology. Named after the Hannibal Bank and the surveyor USS Hannibal that discovered and charted the bank for the first time, presumably in 1934. The name Hannibal evokes the Carthaginian general, considered one of the greatest military commanders in ancient history. In genitive: hannibalis (L) meaning ¨of Hannibal¨. FIGURE 12. Adelogorgia adusta sp. 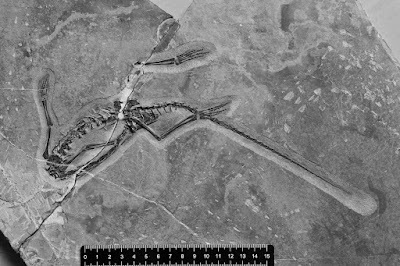 nov., STRI-HH 1220 (holotype). (A) colony; (B) detail of the branches; (C) sclerites. B, photograph by Sean Mattson. Habitat and Distribution. The species was found in the Hannibal Bank, on rocky substrates impacted by currents. Adelogorgia adusta is only known from the type locality Hannibal Bank, from 73 to 94 m deep. The Middle and early Late Triassic of southern China is well known for a remarkable diversity of marine vertebrates, particularly reptiles, including an abundance of intriguing new forms (e.g., Jiang et al., 2005; Hu et al., 2011; Li et al., 2016). Here we describe a new diapsid from Yunnan Province. It possesses an elongate neck that exhibits a remarkable similarity to that of many Protorosauria, yet in other respects the skull and postcranium are much less derived. The new taxon is part of the so-called Panxian-Luoping Fauna and the deposits correspond to the Upper Member of the Guanling Formation, comprising thin to medium bedded, gray to dark-gray laminated marly limestone and limestone, with several layers of bentonite intercalated in the fossil level at Panxian (Wan, 2002; Motani et al., 2008; Jiang et al., 2009). Their age is Pelsonian (middle Anisian, Middle Triassic) as is indicated by the conodont Nicoraella kockeli Zone (Sun et al., 2006; Zhang et al., 2009). A recent U-Pb study indicates the absolute age of these middle Anisian beds to be close to 244 Ma (Wang et al., 2014). Figure 1: Pectodens zhenyuensis n. gen. n. sp., Photograph of the holotype IVPP V18578. Type species: Pectodens zhenyuensis n. gen. n. sp. by monotypy. Etymology: From the Latin pecto meaning to comb and dens meaning teeth; in reference to the comb-like nature of the marginal dentition. Occurrence: Luoping County of Yunnan Province, China; Member II of the Guanling Formation, Anisian, Middle Triassic. Holotype: IVPP V18578. Almost complete articulated skeleton. Etymology: In honor of Zhenyu Li, who contributed greatly to the collection of the specimen from the field. 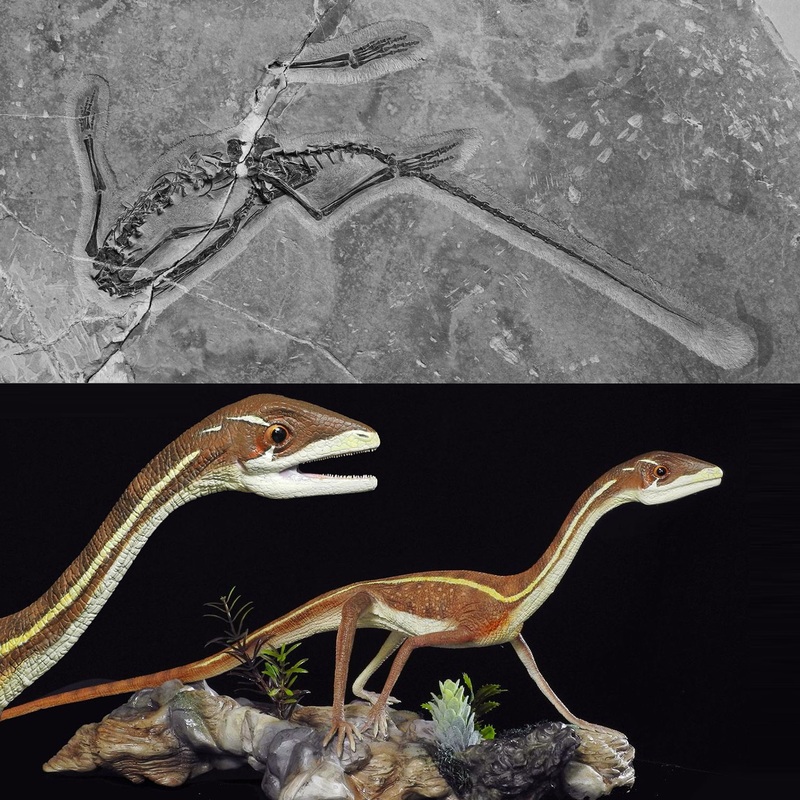 A new, small terrestrial tetrapod is described from the Middle Triassic of Yunnan, China. Pectodens zhenyuensis n. gen. n. sp. bears very characteristic elongate teeth forming a comb-like marginal dentition. The elongate cervicals of Pectodens zhenyuensis n. gen. n. sp. with low neural spines together with the morphology of the cervical ribs are features consistent with protorosaurs, such as Macrocnemus. However, the imperforate puboischiadic plate, simple rounded proximal tarsals, and a straight 5th metatarsal are primitive characteristics. A key protorosaurian character is the long neck with elongated cervical ribs that typically extend across intervertebral articulations. 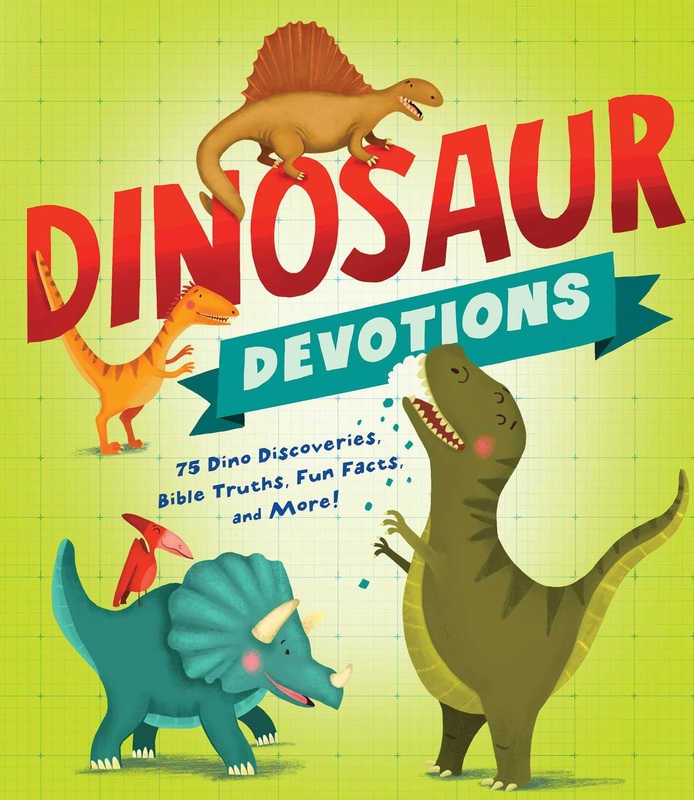 It was mostly on the basis of these characters that Dinocephalosaurus from the Middle Triassic of China was referred to the protorosaurs (Li, 2003). 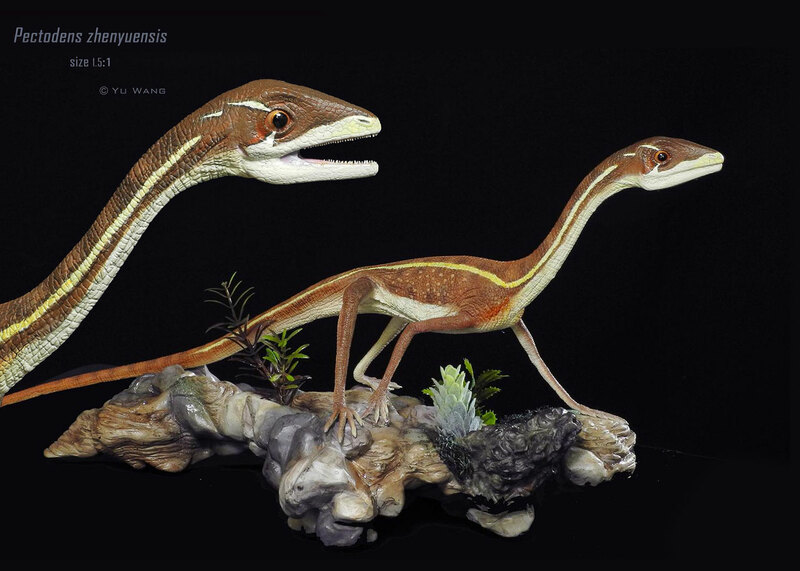 Another long-necked form, Fuyuansaurus, also exhibits certain affinities with protorosaurs, in particular the tanystropheids (Fraser et al., 2013). 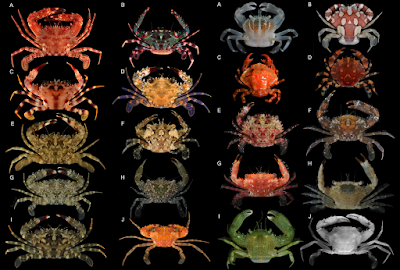 Yet both taxa also display characters that are inconsistent with at least the tanystropheids. Unlike tanystropheids, but in common with Protorosaurus (personal observation, N.C. Fraser, 2013), both lack a thyroid fenestra in the pelvis. The Middle Triassic vertebrate faunas of southern China are largely dominated by marine reptiles and fishes, but occasional terrestrial components (e.g., Macrocnemus fuyuanensis) are recovered from localities in the Zhuganpo Member of the Falang Formation (Li et al., 2007; Jiang et al. 2011). Likewise, Pectodens zhenyuensis n. gen. n. sp. exhibits no adaptations for an aquatic lifestyle; instead the long, slender limbs with pronounced articular ends, and elongate digits together with the claw-like distal phalanges speak to an entirely terrestrial existence. 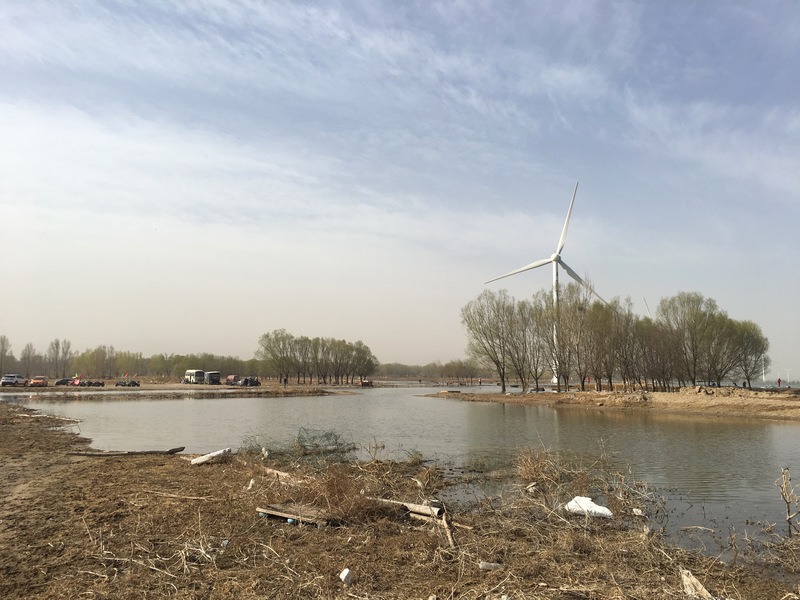 No fully terrestrial vertebrates have been documented previously from the Panxian-Luoping Fauna, although the archosaur Qianosuchus mixtus exhibits a combination of terrestrial and aquatic characteristics (Li et al., 2006). Pectodens is therefore the first fully terrestrial reptile reported from the Guanling Formation. The occurrence of terrestrial reptiles such as Macrocnemus and Pectodens are indicative of the proximity of the ancient coastline at the localities where they occur. 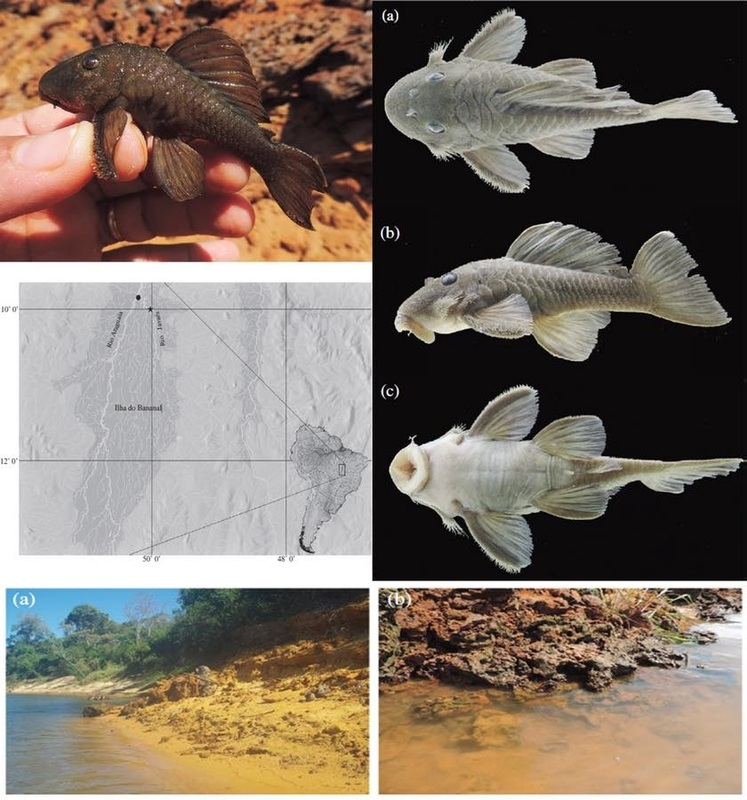 A new species of Spectracanthicus is described from the Rio Javaés, Rio Araguaia basin. 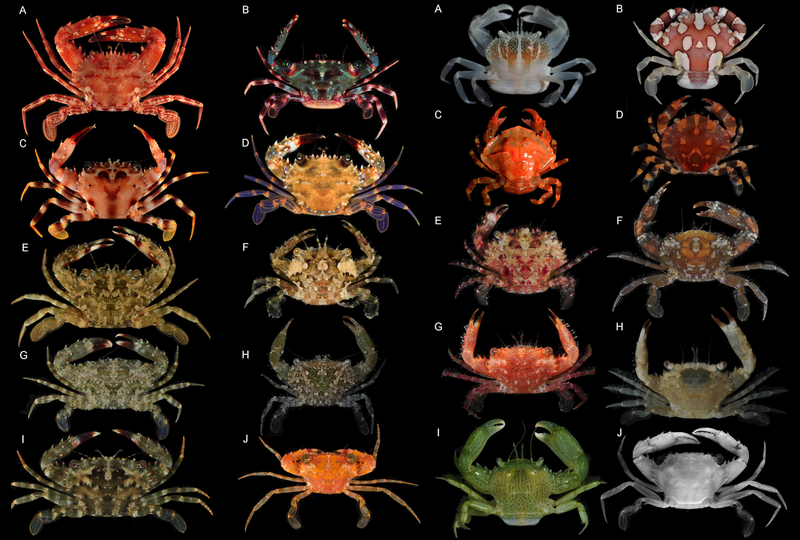 The new species is distinguished from its congeners (except Spectracanthicus immaculatus) by colour pattern: body dark grey to dark brown without dots or blotches (v. body colour with yellowish small dots in Spectracanthicus murinus, Spectracanthicus punctatissimus and Spectracanthicus tocantinensis and large white dots in Spectracanthicus zuanoni). It can be further distinguished from S. immaculatus by having thicker and less numerous teeth, with up to eight premaxillary and 20 dentary teeth (v. teeth thinner and more numerous with up to 22 premaxillary and 30 dentary teeth); dorsal and caudal fins without curved spines (v. dorsal and caudal fins with curved spines). Other osteological characters can also diagnose the new species from its congeners. In addition, a gross brain description and brief comments on the new species' ecological habitat are given. Figure 2. Colour in life of Spectracanthicus javae. Etymology: The specific epithet (a noun in apposition) is in reference to the Javaé people, an indigenous branch of the Karajá people in Brazil who inhabit the Ilha do Bananal and confer the name of the river (Rio Javaés), where the new species was reported. Carine C. Chamon and Lúcia H. Rapp Py-Daniel. 2014. 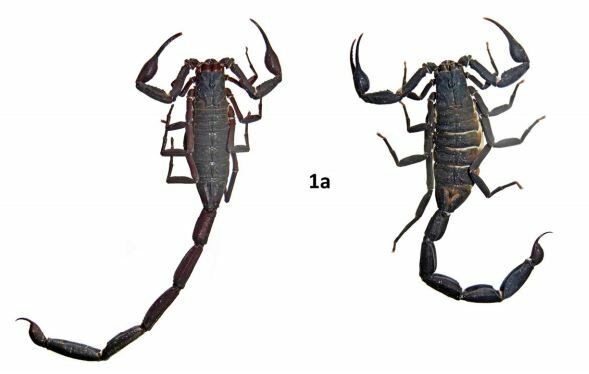 Taxonomic revision of Spectracanthicus Nijssen & Isbrücker (Loricariidae: Hypostominae: Ancistrini), with description of three new species. Neotropical Ichthyology. 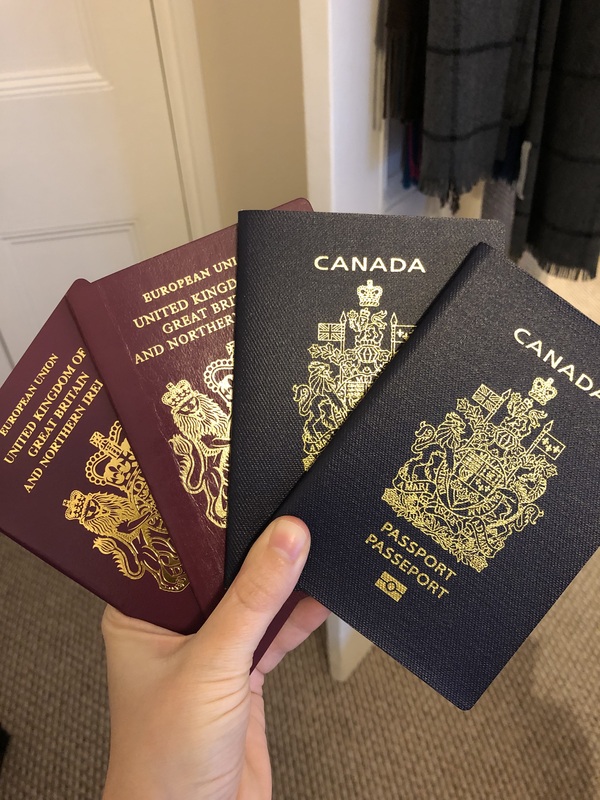 12(1):1-25. (I) Trierarchus rotundifrons, comb. nov. (UF 40067; Guam); (J) Trierarchus squamosus, comb. nov. (USNM 102963; Bikini Atoll; preserved specimen, grayscale, left frontal margin damaged). Photographs (F, H–J) by Nathaniel Evans; photographs (E, G) by Gustav Paulay. 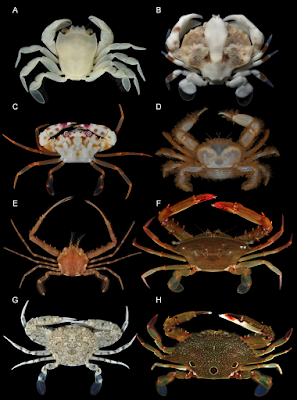 Portunoidea is a diverse lineage of ecologically and economically important marine crabs comprising 8 families and 14 subfamilies. Closely related portunid subfamilies Caphyrinae and Thalamitinae constitute some of this group’s greatest morphological and taxonomic diversity, and are the only known lineages to include symbiotic taxa. 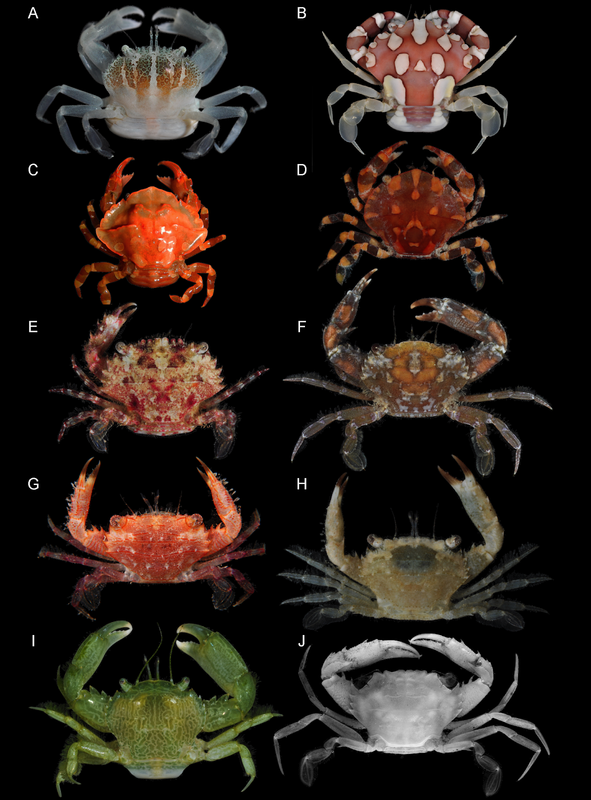 Emergence of symbiosis in decapods remains poorly studied and portunoid crabs provide an interesting, but often overlooked example. Yet the paucity of molecular phylogenetic data available for Portunoidea makes it challenging to investigate the evolution and systematics of the group. Phylogenetic analyses, though limited, suggest that many putative portunoid taxa are para- or polyphyletic. Here I augment existing molecular data—significantly increasing taxon sampling of Caphyrinae, Thalamitinae, and several disparate portunoid lineages—to investigate the phylogenetic origin of symbiosis within Portunoidea and reevaluate higher- and lower-level portunoid classifications. Phylogenetic analyses were carried out on sequences of H3, 28S rRNA, 16S rRNA, and CO1 for up to 168 portunoid taxa; this included, for the first time, molecular data from the genera Atoportunus, Brusinia, Caphyra, Coelocarcinus, Gonioinfradens, Raymanninus, and Thalamonyx. Results support the placement of all symbiotic taxa (Caphyra, Lissocarcinus, and two Thalamita) in a single clade derived within the thalamitine genus Thalamita. Caphyrina Paulson, 1875, nom. trans. is recognized here as a subtribe within the subfamily Thalamitinae. Results also support the following taxonomic actions: Cronius is reclassified as a thalamitine genus; Thalamonyx is reestablished as a valid genus; Goniosupradens is raised to the generic rank; and three new genera (Zygita gen. nov., Thranita gen. nov., and Trierarchus gen. nov.) are described to accommodate some Thalamita s.l. taxa rendered paraphyletic by Caphyrina. A new diagnosis of Thalamitinae is provided. 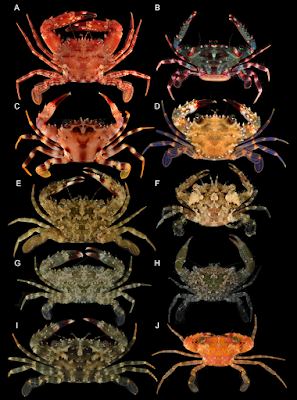 Results also support a more conservative classification of Portunoidea comprising three instead of eight extant families: Geryonidae (Geryonidae + Ovalipidae; new diagnosis provided), Carcinidae (Carcinidae + Pirimelidae + Polybiidae + Thiidae + Coelocarcinus; new diagnosis provided) and Portunidae. Finally, 16s rRNA data suggests family Brusiniidae might not be a portunoid lineage. 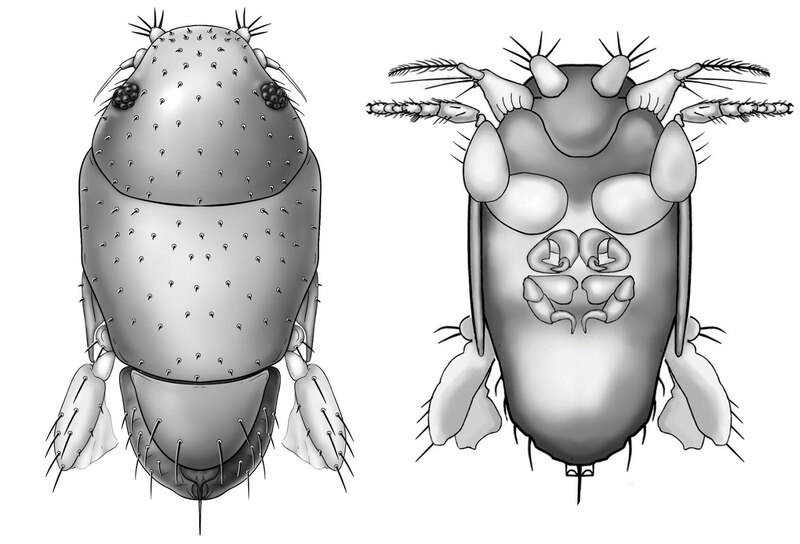 Figure 1: Representatives of various Portunoidea taxa included in this study. (A) Brusinia profunda (USNM 277519; New Caledonia; preserved color); (B) Coelocarcinus foliatus (UF 40176; Guam); (C) Carupa tenuipes (UF 39918; Palau); (D) Libystes (UF 23926; Moorea Is. ); (E) Lupocyclus cf. 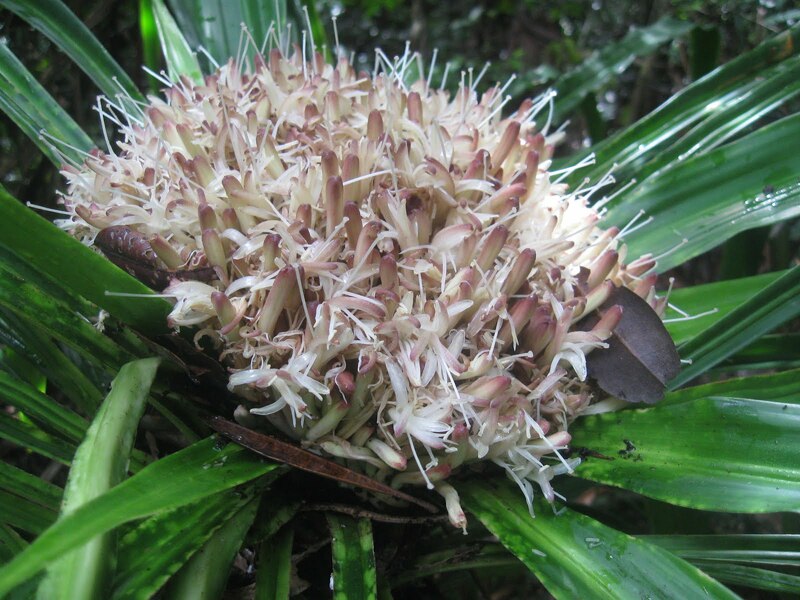 philippinensis (UF 41639; Luzon Is. ); (F) Podophthalmus vigil (UF 24543; Moorea Is. ); (G) Portunus (Cycloachelous) granulatus (UF 40021; Guam); (H) Portunus (Portunus) sanguinolentus (UF 24538; Moorea Is.). Photographs (A–C, G) by Nathaniel Evans; photographs (D–F, H) by Gustav Paulay. Figure 2: Representative non-symbiotic Thalamitinae species. (A) Cronius ruber (UF 35672; Florida); (B) Thalamitoides spinigera (UF 36697; Farasan Banks); (C) Gonioinfradens paucidentatus (UF 37141; Red Sea); (D) Goniosupradens acutifrons (UF 7114; Okinawa); (E) Charybdis orientalis (UF 41638; Luzon Is. ); (F) Thalamonyx gracilipes (UF 42972; Mindoro Is. ); (G) Thalamita admete (UF 40031; Guam); (H) Thalamita chaptalii (UF 39917; Palau); (I) Thranita coeruleipes, comb. nov. (UF 40078; Guam); (J) Thalamita cf. 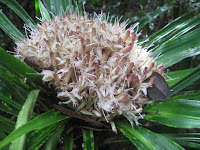 philippinensis (UF 43302; Mindoro Is.). Photographs (A, G–I) by Nathaniel Evans; photographs (B–F, J) by Gustav Paulay. 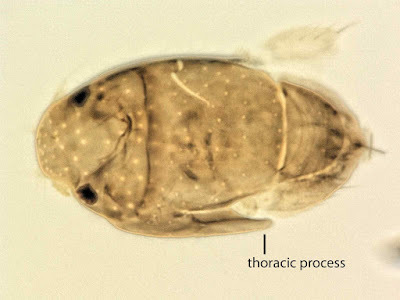 Figure 3: Representative putative symbiotic Thalamitinae species. 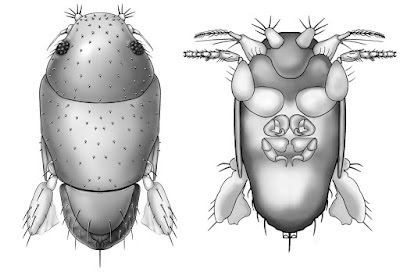 (A) Caphyra loevis (UF 39060); (B) Lissocarcinus cf. 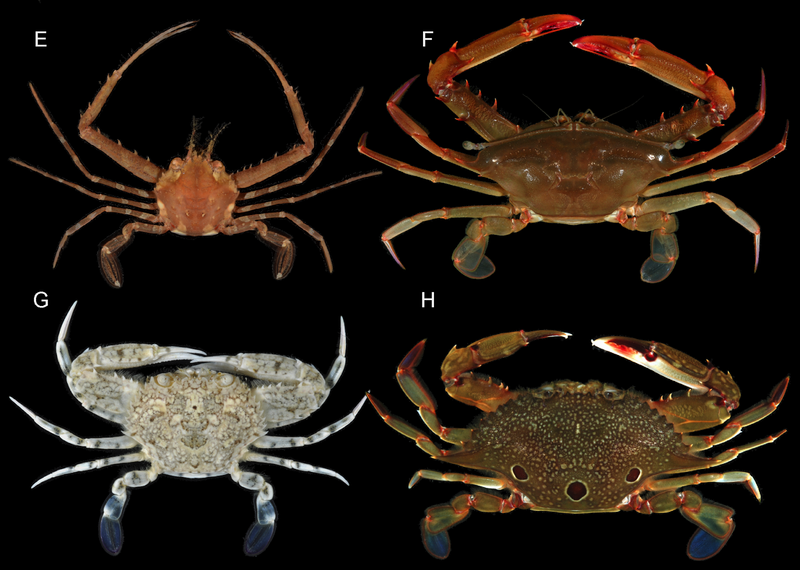 laevis (UF 39136; New Caledonia); (C) Lissocarcinus holothuricola (UF 30182; Marquesas); (D) Lissocarcinus orbicularis (UF 23972; Moorea); (E) Zygita murinae, comb. nov. (UF 36721; Farasan Banks); (F) Trierarchus woodmasoni, comb. nov. (UF 40079; Guam); (G) Trierarchus cf. cooperi sp. A, comb. nov. (UF 16023; Moorea Is. ); (H) Trierarchus cf. cooperi sp. B, comb. nov. (UF 40100; Guam); (I) Trierarchus rotundifrons, comb. nov. (UF 40067; Guam); (J) Trierarchus squamosus, comb. nov. (USNM 102963; Bikini Atoll; preserved specimen, grayscale, left frontal margin damaged). Photographs (A–C, F, H–J) by Nathaniel Evans; photographs (D, E, G) by Gustav Paulay. This study constitutes the most comprehensive molecular phylogenetic analyses of Portunoidea to date, but highlights numerous areas where additional work is needed. Results support a more conservative classification of Portunoidea with three instead of eight extant families: Geryonidae (Geryonidae + Ovalipidae; new diagnosis provided), Carcinidae (Carcinidae + Pirimelidae + Polybiidae + Thiidae + Coelocarcinus; new diagnosis provided) and Portunidae. 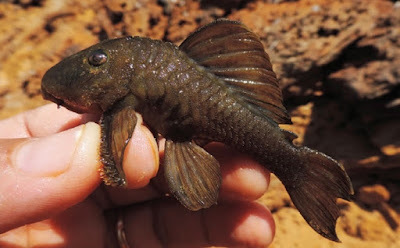 Limited molecular data also suggest that the family Brusiniidae may still be valid, but might not be a portunoid lineage. A major aim of this study was to investigate the molecular phylogenetic origin of symbiosis within Portunoidea by substantially increasing taxon sampling of the subfamilies Caphyrinae and Thalamitinae. 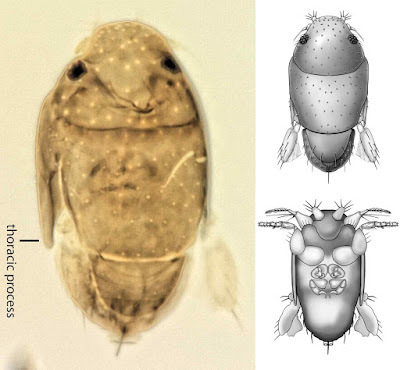 Results support a shared ancestry of all symbiotic taxa (Caphyra, Lissocarcinus, and two Thalamita) derived within the thalamitine genus Thalamita. Consequently, Caphyrina Paulson, 1875, nom. trans., should be considered a subtribe within the subfamily Thalamitinae. Although the nature, degree, and phylogenetic pattern of symbiosis within Caphyrina needs further study, this clade is clearly dominated by symbiotic taxa and likely originated from a symbiotic ancestor. Results presented here also support the following taxonomic actions within Thalamitinae: Cronius is reclassified as a thalamitine rather than a portunine genus; Thalamonyx is reinstated as a valid genus; Goniosupradens is raised to the generic rank; and three new genera (Zygita gen. nov., Thranita gen. nov., and Trierarchus gen. nov.) are described to accommodate some Thalamita sensu lato taxa rendered paraphyletic by Caphyrina. A new diagnosis of Thalamitinae has also been provided. Flies of the family Phoridae (Insecta: Diptera) are amongst the most diverse insects in the world, with an incredible array of species, structures and life histories. Wiithin their structural diversity is the world's smallest fly, Euryplatea nanaknihali Brown, 2012. A second minute, limuloid female phorid parasitoid fly (Diptera: Phoridae) is described. Known from a single specimen from a site near Manaus, Brazil, Megapropodiphora arnoldi gen. n., sp. n. is only 0.395 mm in body length, slightly smaller than the currently recognised smallest fly, Euryplatea nanaknihali from Thailand. The distinctive body shape of M. arnoldi, particularly the relatively enormous head, mesothorax and scutellum, the latter of which covers most of the abdomen, easily separates it from other described phorids. Most remarkably, the forelegs are extremely enlarged, whereas mid- and hind legs are reduced to small, possibly vestigial remnants. A possible male specimen, unfortunately destroyed during processing, is briefly described. Figure 2. Megapropodiphora arnoldi sp. n., female, dorsal view. 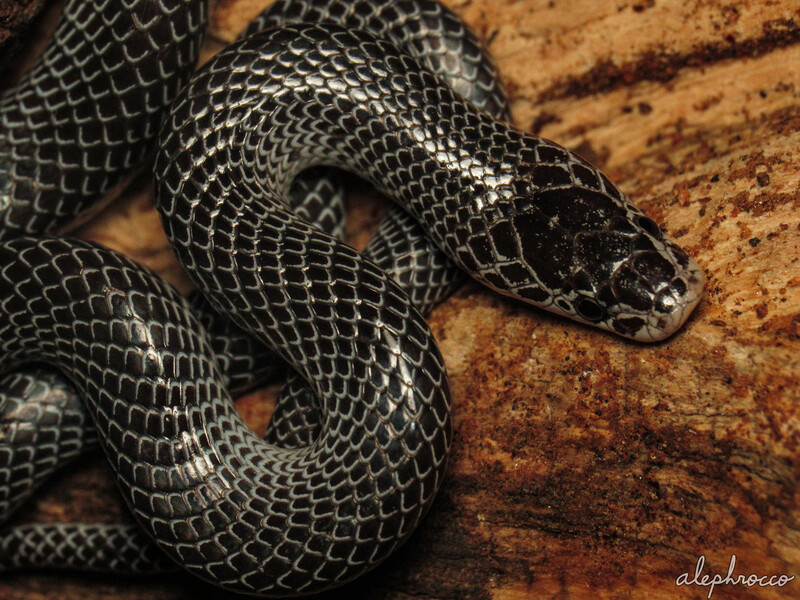 Body length=0.395 mm. Figure 3. Megapropodiphora arnoldi sp. n., female, ventral view. Legs re-arranged for easier viewing. Structure of mid- and hind legs approximate. Megapropodiphora Brown, 2018, gen. n.
Type species: Megapropodiphora arnoldi Brown 2018, sp. n.
Diagnosis: There are a small number of minute, limuloid phorid genera in the world. 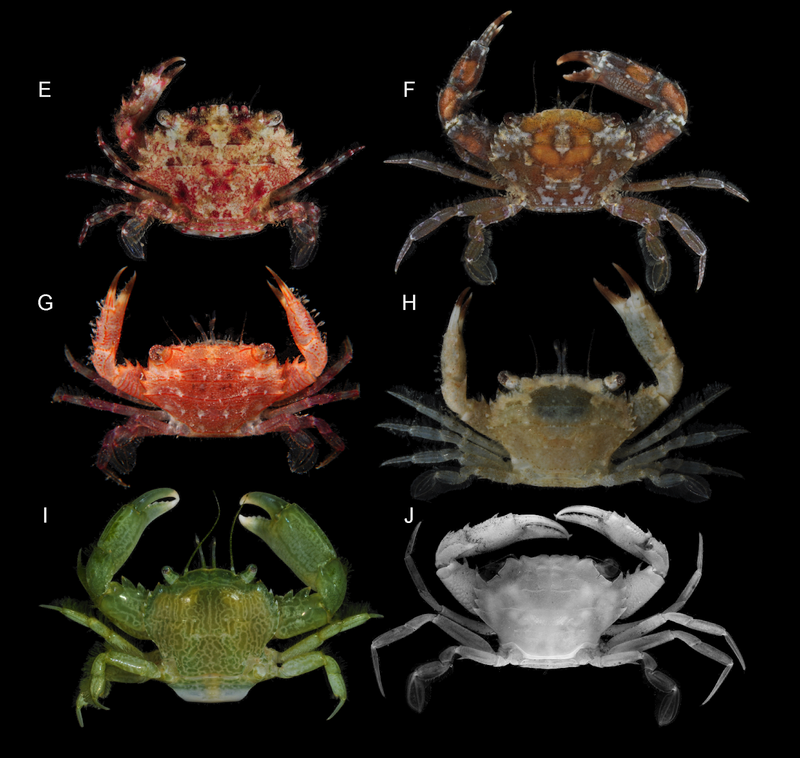 In the New World tropics, the only relatively similar genera have large, differentiated frontal setae that are several times longer than the short frontal setae and do not have the scutellum covering the abdomen (Brown 1993). The Old World species of the genus Euryplatea Schmitz, likewise differ by having the abdomen not covered by the scutellum and by having a solid, triangular wing rudiment (Brown 2012). Megapropodiphora arnoldi Brown 2018, sp. n.
Diagnosis: Female. Minute, limuloid; body setae scattered, sparse; wing with shed blades and short costa; head and scutum large, scutellum covering almost entire abdomen; oviscape thin, pointed, indicating a parasitoid lifestyle. Edge of scutum lateroventrally extended, posteriorly ending in narrowed flange (Fig. 4). Forelegs greatly enlarged; mid- and hind legs reduced. 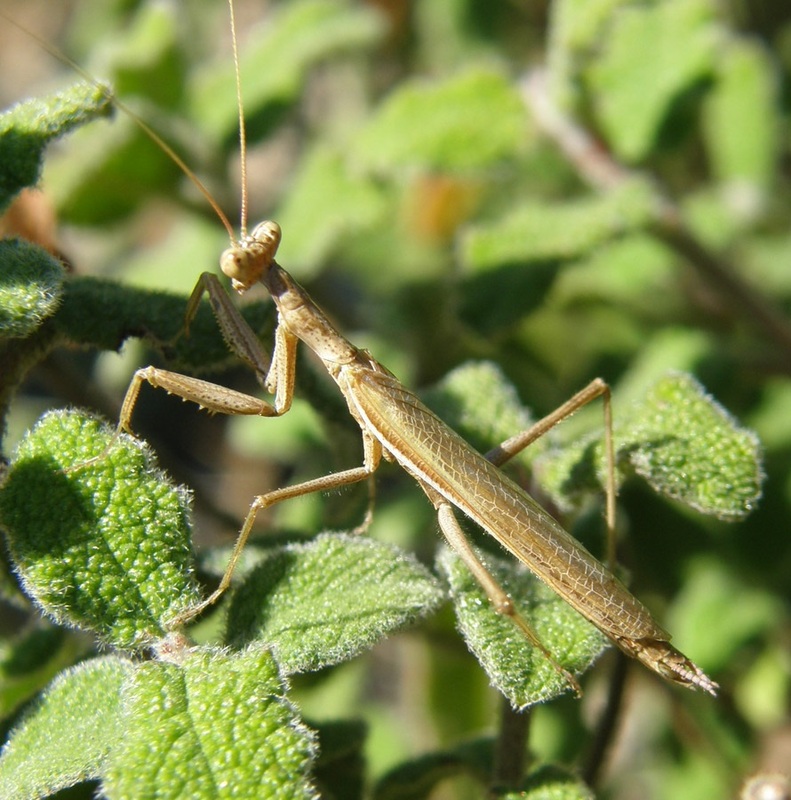 Similar genera. Males of Brachycosta Prado, 1976, have a short costa, but much longer than that of Megapropodiphora gen. n., are much larger in size and have a larger frons and head. Females of this new genus are differentiated from all other phorids by minute size, leg structure and elongation of the scutellum to cover the abdomen. Etymology: The genus name is Latin for large foreleg, referring to the structure of the female. The specific epithet refers to Arnold Schwarzenegger, former governor of California, whose own greatly enlarged forelimbs distinguished him in his pre-political careers. Biology: Unknown, but almost certainly a parasitoid. The torn wing membrane is reminiscent of other phorid flies that shed their wings when entering a social insect colony. 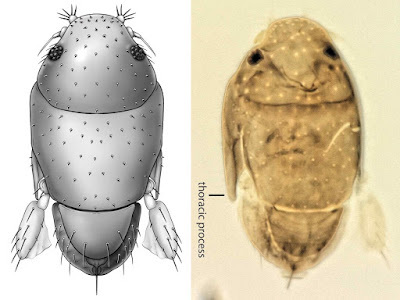 It seems likely that the greatly enlarged forelegs are used to clutch a host, upon which the small, rounded body would appear similar to that of many phoretic mites. Figure 4. Megapropodiphora arnoldi sp. n., female, dorsal, slightly oblique. Photomicrograph by B. Brown.